Tigran Mkrtychev, deputy director (research) at the State Museum of Oriental Art, is brimming with excitement about the grandeur of Indian art works. In this interview to RIR, Mkrtychev speaks about plans to stage an exhibition of miniatures from the Great Mughal period in India, Nicholas and Svyatoslav Roerichs’ paintings and the potential joint publication of Russian-Indian scholarly works on art. What is unique about the State Museum of Oriental Art’s Mughal collection? What’s the update on the plan to take these art treasures to India? The Indian collection of the State Museum of Oriental Art contains around 3,000 items. The magnificent collection of miniatures, in which the works of the Mughal school justifiably occupy an important place, has enormous artistic value. 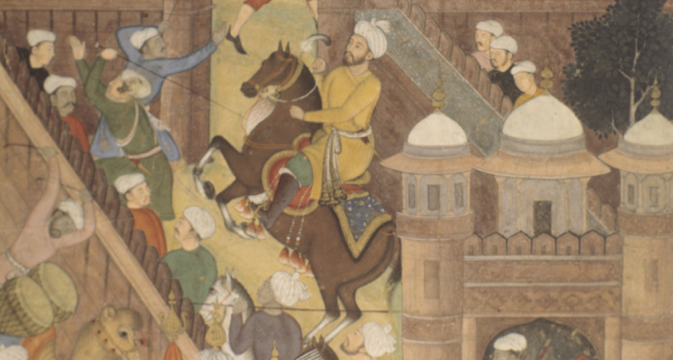 The illustrations for the historical memoirs known as “The Baburnama,” which were written by the legendary Indian emperor Babur, are an especially valuable part of the collection. The museum holds exquisite miniatures that are very precise illustrations of the text. The flora and fauna of India, the inside decoration of the palaces, military scenes, hunting scenes, sumptuous banquets - all of this can be seen in the museum’s galleries. Because of its magnitude, this collection matches the largest collections in Delhi and London, and we have long wanted to show it outside of Russia. I met with the director of the National Museum in Delhi to talk about this. The exhibition will probably open at the end of next year. It requires a lot of preparation. We’re also planning to publish an accompanying catalogue in Russian and English; the catalogue will include scholarly articles by Russian and Indian researchers on the Mughal miniatures. It will enable us to juxtapose the opinions of scholars from two countries - it would be interesting to compare them. This year, India and Russia will be marking the 140th anniversary of the birth of Nicholas Roerich and the 110th anniversary of the birth of his son, Svyatoslav Roerich. Is there a plan to host an exhibition of their paintings? We have a strong collection of Nicholas and Svyatoslav Roerich’s paintings. This is actually another reason for my being here. We would surely like to exhibit the Roerichs’ paintings from the collection of the State Museum of Oriental Art. We have discussed this initiative with the management of a few museums, including the National Gallery of Modern Art. That museum did a big exhibit on the Roerichs in 2010, so there’s no sense doing another one like it. But this doesn’t take the issue off the table. We’re drawing on our collection to prepare thematic exhibitions, such as on Nicholas Roerich’s mythology, based first and foremost on his paintings. The artist used historical and mythological stories that the modern viewer is generally unfamiliar with. Our task is to not only to show the painting, but also to give them context, to show what the artist wanted to say in a given work. Even though the Roerichs’ work is well known, this dimension will interest everyone, and until now no one has addressed it. We’re considering two possibilities: bringing copies and bringing originals. You’ve touched on a fascinating topic: the publication of joint scholarly work. Does this topic have long-term potential for researchers from our countries? I was born in an old Russian city that was significant for the history of Russian-Indian relations: Tver, which was also where the merchant Afanasy Nikitin was from. He spent a few years in India in the 15th century. Why am I mentioning this? In my view, these cultural ties, which developed over the course of centuries, must be continued on a new level. Of course, we are first and foremost interested in joint research. It can also be research by Indian Russianists, who will study Russian culture. Russia is interested in India’s mythology and its crafts: how the crafts are evolving in India, how the government is working with craftsmen, plans by the authorities to preserve crafts. India is a massive country with countless fascinating crafts of its own that are like nothing else in this world. Are you planning to bring some works of Indian art to Russia? We’re willing to do that. But such an undertaking needs to be planned and executed thoroughly. The plans need to be concrete. I came here with proposals and I hope to receive counterproposals from the Indian side. We’re open to them. In Russia, and in particular in the State Museum of Oriental Art, there have not been any good Indian exhibitions recently, not counting the exhibition of jewellery in the Kremlin Museums, “India: Jewels That Enchanted the World.” There are a variety of options - from archaeology to crafts to sculpture. For example, we’re arranging an extensive collection of miniatures, but we don’t have any decorative applied art. That includes things like carvings. We also discussed the possibility of combining our collections of miniatures and showing them in countries other than Russia and India. The Indian side greeted this proposal warmly. In Europe and the United State, there is huge interest in Mughal art.